Verona, NY, USA; Super Welter: Jamie Munguia (29-0) W TKO 4 Sadam Ali (26-2). Super Bantam: Rey Vargas (32-0) W PTS 12 Azat Hovhannisyan (14-3). In a huge upset Ali losses his WBO title in his first defence as he is destroyed inside four rounds by late substitute and relatively unknown Mexican Munguia. Munguia looked a couple of divisions bigger than Ali but the champion showed lots of movement and threw a fast but light combination. Munguia just stalked Ali. Munguia did a good job of cutting the ring off and with less than a minute gone he crashed home a right to the body and a crunching left hook to the head and Ali went down heavily on his back. he rolled up and took the count on his knees getting up at seven. After the count Munguia went after Ali and landed another couple of punches that had Ali stumbling and hanging on. Ali tried to stay out of trouble but another couple of chopping rights to the head sent him sprawling to the canvas. He was up quickly but was on shaky legs. When the action resumed Munguia was throwing big punches looking to finish things but he was too wild. Munguia was stalking Ali and landing more hard rights. Ali kept moving and countering but Munguia was too strong and was getting through with hooks and uppercuts. He landed two big rights to the head that unhinged Ali’s legs and landed a couple of cuffing lefts as Ali tumbled forward to the floor. He was up quickly and with the bell having gone he went back to his corner after the eight count. The referee went to Ali’s corner in the interval Ali was grazed above his left eye and there was a swelling over his right but Ali was allowed to continue. 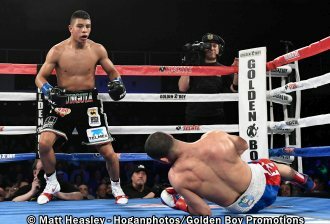 Munguia was on the prowl again in the third and looked to have shaken Ali with a right to the head early in the round. Ali was moving and just trying to stay out of trouble and buy some recovery time. For a while he got his act together and scored with hooks and uppercuts but at the end of the round he was under pressure again and on wobbly legs before Munguia wrestled him to the floor. There was no count but again Ali looked hurt. Ali had pleaded to be given one more round and this time there was an even more intense scrutiny of Ali by the referee and ringside physician. After the bell went to start the round the physician was still in the ring getting Ali to walk ahead and sideways before being satisfied the fight should continue. Munguia was loading up on every punch but in the end it was a stiff left jab that sent Ali down and although he was getting up immediately the referee rightly waived the fight over. Massive upset as Munguia came in as a very late substitute after Liam Smith had to pull out due to illness. He is just 21 and was having only his second fight outside Mexico. He had not met any fighters anywhere near the ratings, however he had won 18 of his last 19 fights by KO/TKO so the danger was there. How quickly things can change. In December Ali had won the WBO title with a victory over Miguel Cotto and five months later his career is in tatters after this crushing defeat. Vargas retains WBC title with unanimous decision over Hovhannisyan in a blood splattered matador vs. bull confrontation with an interesting sidelines tactical contest between Hall of Fame trainers with Vargas having Nacho Beristan in his corner and Hovhannisyan working with Freddy Roach. Vargas had huge reach and height advantages and managed to keep Hovhannisyan out for the first minute but then the Armenian began to live up to his “Crazy|” nickname throwing himself forward winging wide punches. He did better when he fired a straight right to the head and Vargas buckled at the knees clearly hurt and Hovhannisyan chased him trying to build on that. Vargas did plenty of good work with his jab and straight rights but the round went to Hovhannisyan and Vargas was showing a small cut on his nose from that Hovhannisyan right. A much better round for Vargas. He used plenty of movement to avoid Hovhannisyan’s lunging attacks and scored regularly from distance with his jab and rights. He was getting his punches off and getting away before Hovhannisyan could land anything but over the last minute he was under pressure from storming attacks from Hovhannisyan. This was a closer round as Hovhannisyan hustled and harassed Vargas with the champion still doing the scoring at distance and catching Hovhannisyan with counters. The cleaner work was still coming from Vargas and he took the round. Vargas was landing his jab at distance, countering Hovhannisyan’s rushes and scoring with quick bursts of punches. Hovhannisyan just kept coming and was dangerous with some of his wild swing and pumped home short punches inside but Vargas outscored him. Hovhannisyan’s pressure paid off in this one. Vargas managed to probe and counter early. Hovhannisyan began to get through with hooks from both hands and seemed to momentarily shake Vargas with a couple of head-snapping left hooks just before the bell. A closer round. Hovhannisyan managed to get through with some hard left hooks and was roughing Vargas up inside. Vargas was landing hard punches to the body and was more accurate with his work and continually beckoning for Hovhannisyan to come forward but for the last thirty seconds “Crazy” Hovhannisyan strolled around the ropes refusing to be drawn onto counters. Another round for Vargas. Hovhannisyan was becoming wilder and wilder with his attacks and after he missed with a right his head crashed into the right side of Vargas face and opened a cut on the champions eyelid. Vargas was having no trouble dodging Hovhannisyan’s attacks and was slotting home jabs and landing left hooks to the ribs of Hovhannisyan. A right to the body unbalanced Vargas but he was soon back to peppering Hovhannisyan with punches. The cut was serious for Vargas and his corner were unable to stem the bleeding before the round started. Hovhannisyan was also cut on his right eyelid but it was a smaller cut a much lesser problem. The cut fired Vargas up and he went looking for Hovhannisyan banging home bunches of hooks to the body and getting the better of the exchanges. Vargas was timing Hovhannisyan’s lunges and taking a couple of steps back and then firing counters. Hovhannisyan kept pressing and was still dangerous but Vargas was able to land left hooks and uppercuts and was not letting Hovhannisyan work inside. Hovhannisyan continued to lunge in with furious attacks with Vargas firing home quick combinations. and moving with Hovhannisyan swishing empty air. Vargas was not able to stop Hovhannisyan charging but he was making him pay the price in counter punches. About one minute into the round another clash of heads saw Vargas cut over his right eye and this too was a serious one. The referee stopped the action so that the ringside physician could inspect this second cut but the fight was allowed to continue. Hovhannisyan launched big punch after big punching looking for a knockout and Vargas with blood streaming down both sides of his face took no chances and just stayed out of trouble. Vargas was making the third defence of the WBC title. Fellow Mexican Jorge Ceja is his No 1 challenger but it will be some time before the cuts he suffered in this fight heal. Armenian Hovhannisyan had won his last eight fights but his only “name” opponent was his last victim Ronny Rios who had lost on points to Vargas in his first defence in August last year. Hovhannisyan proved strong and dangerous but limited and once Vargas had worked out how to deal with Hovhannisyan’s rushing attacks the Armenian had no plan B.
Bolton, England: Heavy: Hughie Fury (21-1) W TKO 5 Sam Sexton (24-3). Super Middle: Reece Cartwright (21-1) W KO 3 Juan Monzon (8-2-3). Fury outboxes and then stops Sexton to win the British title. Fury had height, reach and speed on his side and Sexton never really managed to make an impact. Fury was content to box on the back foot slotting jabs through the guard of Sexton and then hammering straight rights through the centre and on to Sexton’s head. Sexton shadowed Fury but never really upped his pace enough to really threaten. On the occasions when Sexton did pin Fury to the ropes he landed a few head punches but Fury had very little trouble in avoiding any traps and he continually landed his jabs and banged home hard rights. Once Fury started to really load up on his rights Sexton was in trouble. A big right in the fourth sent Sexton sideward’s into the ropes and he was already starting to drop when Fury landed anther right. Sexton was up quickly and the bell went just as the eight count was completed. Sexton marched forward in the fifth trying to get inside. Fury unloaded some more heavy rights but Sexton kept coming. With Fury on the ropes Sexton moved inside and Fury landed a thunderbolt of a right which floored Sexton. He made it to his feet but the referee waived the fight over despite protests from Sexton that he was able to continue. Still only 23 the 6’6” (198cm) Fury was having his first fight since losing a majority decision to Joseph Parker in September. In the stupid and cynical way the WBO works Fury went from No 1 to unrated for losing a majority decision to the champion! Sexton was making the first defence of his British title and suffers his fourth loss by KO/TKO. His other losses were to Dereck Chisora twice and David Price but he had won his last nine fights. As usual Cartwright towered over his Argentinian opponent. He was able to use a strong accurate jab to dominate the action. He scored with some long right crosses in the first with Monzon trying to fight back but not really getting past the jab and missing with some wild swings. Monzon used plenty of upper body movement to try to get close in the second but Cartwright stabbed home the jab and raked Monzon with straight rights. Early in the third Cartwright landed a booming right that sent Monzon down. He managed to get to his knees but no further . The 23-year-old 6’3” (191cm) now has 12 wins by KO/TKO. His loss was a shock first stoppage by the dangerous but erratic Rafael Chiruta in July last year. Two losses on the bounce for Monzon who was stopped in six rounds by Jake Carr in Australia in December. Hurth, Germany: Super Middle: Avni Yildirim (18-1) W PTS 12 Ryan Ford (14-3).Light Heavy: Serge Michel (6-0) W TKO 3 Attila Tibor Nagy (11-33-1). Super Middle: Yusuf Kanguel (16-2-1) W RTD 5 Dionisio Miranda (22-17-2). Yildirim retains the WBC International title with unanimous points win over Canadian Ford in a tough, gruelling contest that was a credit to the strength and determination of both men and another good quality WBC International contest. Yildirim was rolling forward from the start with Ford meeting him and looking to stand and trade Yildirim was digging heavy left hooks to the body with a double hook catching Ford’s attention in the first. Yildirim was setting a high pace and was throwing more and landing more than Ford but the Canadian was not backing down and landed his share of clubbing punches. You could have dispensed with the ropes as these two stayed in ring centre each landing clubbing head and body shots. Ford impressed with some of his combinations mixing hooks, uppercuts and short rights. The referee was also under used as they were both looking to outland the other and not looking to clinch until late in the fight when they both tired. Yildirim had the better jab and the greater strength and that told in the closing rounds as he finally had Ford backing up and Ford’s work rate dropped. Somehow they both found the energy to stand and exchange punches for the last three minutes. Scores 117-112, 116-112 and 117-113 all for Yildirim. The 26-year-old Turk was making the second defence of his WBC International title and this had to be one of his toughest fights as he rebuilds after his loss to Chris Eubank Jr in October. He is No 5 with the WBC and No 7 with the WBA and if he keeps winning he could be in line for a title shots by early 2019. The 36-year-old “Real Deal” Ford (he does resemble the great Evander) has now lost three decisions in a row but this is one tough fighter and all three losses have been on the road. Olympian Michel gets an inside the distance win with stoppage of Nagy. Michel landed some hard stuff over the first two rounds and then floored Nagy three times in the third to force the stoppage. The Russian-born “Bavarian Sniper” makes it five wins by KO/TKO. As an amateur he was German champion and competed at the 2016 Olympics. He was eliminated at the European Qualifier by Joshua Buatsi but he won through to Rio at the World Qualifier in Baku but failed to medal in Rio. He spent time in both Juvenile detention and prison but has stayed out of trouble since taking up boxing seriously, Nagy is now 1-11 in his last 12 fights. Kanguel extends his winning run to nine as Miranda retires after five rounds. Despite Miranda having the longer reach Kanguel was able to dominate the centre of the ring forcing Miranda on to the back foot. The Colombian veteran had a good second round being able to use his reach to outscore Kanguel. The third and fourth went to Kanguel with Miranda cut in a clash of heads. Kanguel took a fiercely competitive fifth before breaking through at the end of the round to land a series of hard punches and Miranda did not come out for the sixth. Tenth win by KO/TKO for the 34-year-old WBC Mediterranean champion. Miranda, 35, has now lost his last nine fights and this is just his second outing in the last two years. Mississauga, Canada: Super Welter: Brandon Cook (20-1) W KO 4 Miguel Suarez (15-2). Light: Josh O’Reilly (12-0) W RTD 4 Omar Valenzuela (10-7-2). O’Reilly and Valenzuela provided plenty of entertainment as they both were looking to trade punches and neither wanted to take a step back. Valenzuela looked to take the second by staying on top of O’Reilly. The third was more even as although Valenzuela kept attacking he was beginning to tire. O’Reilly was landing heavily with hooks to the body in the fourth and when O’Reilly dug in a left to the body Valenzuela fell to his knees. He beat the count and tried to punch his way out of trouble but a right to the head and a left to the body sent him to his knees again. He got up and was allowed to continue and took the fight to O’Reilly but after the round ended he stayed in his corner. O’Reilly, the Canadian No 3, has won 4 of his last 5 fights by KO/TKO. Mexican Valenzuela was fighting in Canada for the fourth time in successive contests and is now 1-3 in those four fights. Lanky local Ramirez wins the vacant national title at super light as he knocks out Rico with a short right to the chin after just sixty seconds. Ramirez, who also holds the national light title gets win No 8 by KO/TKO. This is his first fight since losing his unbeaten tag against 17-0 Sonny Ferguson in November. Rico had won his last three fights. After a bad 2017 which saw him lose to both Oscar Valdez and Vasyl Lomachenko in title fights Marriaga eases back with a stoppage of overmatched Venezuelan Buriel. No knockdowns but Buriel was shipping heavy punches when the fight was stopped. Marriaga has dropped out of the ratings but all of his losses have been in world title fights so is aiming to rebuild and land another title fight. Second loss by KO/TKO for Buriel. A bad night for visitors from Venezuela as Preciado halts Alfaro in three rounds. Again the visitor was overmatched and was never really in the fight before it was stopped. Eleven wins by KO/TKO for Preciado with Alfaro now 2-3-1 in his last six fights. In an all-Colombian battle Figueroa wins the WBC Fecarbox title with majority decision over Luis Diaz. Going into this one Diaz had lost his last four fights by KO/TKO all inside three rounds but Figueroa made heavy work of this and only just edged Diaz out,. Scores 96-94 and 96-95 for Figueroa and 95-95. Figueroa has won 3 of his last 4 but is strictly domestic level. Now five losses in a row for Diaz. Florence, Italy: Fly: Mohammed Obbadi (16-1) W PTS 12 Aramis Torres (7-1-1). Obbadi regains the European Union title with decision over inexperienced but gutsy Spaniard Torres. It looked as though it might be an early night when Obbadi dropped Torres to his knees in the first but Torres beat the count and was never really in trouble after that. The fight turned into a tactical battle which Obbadi controlled with his superior skills and good movement. Torres was focusing on the body and had some success. Obbadi’s corner told him to up the pace from the seventh and Obbadi swept that round and the eighth. Torres had a good ninth but Obbadi finished strongly to take the decision. Scores 119-110, 118-109 and116-111 for Obbadi. The 24-year-old Moroccan-born Obbadi had previous relinquished this title but his hopes of a world title shot suffered a set-back when he was beaten in seven rounds by the now WBC champion Cristofer Rosales. In his last fight Torres, 22, had fought a draw for the vacant Spanish title but this was too big a task for him here. Riga, Latvia: Light: Isa Chaniev (13-1) W PTS 12 Ismael Barroso (20-2-2). Middle: Artur Akavov (19-2) W PTS 10 Gonzalo Coria (12-2). Super Welter: Konstantin Ponomarev (34-0) W PTS 8 Ambrosi Sutidze (11-14-5). Chaniev outpoints Barroso in defence of his WBO and IBF Inter-Continental titles. Venezuelan southpaw Barroso had height and reach over Chaniev who tried to work his way inside fighting from a crouch. Barroso scored with a chopping left and later with some straight lefts as Chaniev tried to get inside. Barroso was forcing Chaniev back in the second but the Russian showed some quick footwork and constantly changed guards although having problems getting close enough to work. In the third Chaniev was boxing southpaw and darting in with scoring punches and Barroso was too slow to counter. As Chaniev leapt in for another attack a right from Barroso sent him stumbling sideward’s and his glove touched the canvas as he tumbled into the ropes. He did not go down but the referee rightly applied a count over Chaniev’s protests. Chaniev was credited with a knockdown later in the round when Barroso seemed to trip over Chaniev’s leg. Chaniev is a quick, aggressive little fighter who can change guard in a split second. Part of the reason for that is that his stance is so square which allows for the quick change but also presents a bigger target. For that reason Barroso was able to land strong lefts throughout the fight but Chaniev’s speed was the determining factor as the fight progressed. He alternated between dancing around the ring and sudden attacks with quick bursts of punches and a frustrated Barroso had difficulty pinning the Russia down. Barroso was able to land some shots but not enough and he tired over the later rounds as Chaniev continued to buzz around the ring launching attacks from every angle. Chaniev was the clear winner and also benefited from a point deduction against Barroso in the ninth for a low punch. Scores 117-109, 116-108 and 115-112 all for Chaniev. Chaniev, 25, has wins over Jean Pierre Bauwens and Juan Martin Elorde and is No 5 with the WBO. His eccentric, unorthodox style is such that it is almost impossible to look good against him so it is the type of fight you only take if the money is good. Barroso, 35, a former interim WBO champion stopped Kevin Mitchell but was beaten by Anthony Crolla. Barroso was inactive for 17 months after losing to Crolla but had returned with a useful win in October over Fidel Maldonado. Former WBO title challenger Akavov gets a close unanimous decision over Argentinian Coria. The fight started well for southpaw Akavov as he dropped Coria in the first. Coria didn’t cave in but fought back strongly. Both fighters had good spells in a very competitive match and Coria clawed back the two points the knockdown cost him and looked as though he was going to win this one until his work rate dropped over the last two rounds. Scores 96-93, 96-95 and 95-94 for Akavov showing that without the knockdown the visitor was worth at least a draw. The 32-year-old Californian-based Russian Akavov wins the vacant WBO International title. He gave Billy Joe Saunders a lot of trouble in his challenge for the WBO title in 2016. He came in as a late substitute with the WBO suddenly jumping him into their ratings at No 10 before the fight and then dropping him completely for losing a decision to Saunders. Coria, the Argentinian No 3 at super welter and also a southpaw, had won his last nine fights. He was both moving up from eight rounds and having his first fight outside Argentina and made a good impression. Just a keep busy fight for the unbeaten young Russian. Facing a poor opponent who came in as a late substitute he obviously found it hard to get excited about this one and put in an adequate but pedestrian performance winning easily but not impressing. Scores 80-73 twice and 78-74 for Ponomarev. “Talant” Ponomarev is rated IBF 9(7) and WBC 9 at welter. He is just 25 but with victories over Mike Zewski, Ramases Agaton, Brad Solomon and Ed Paredes he should be fighting better opposition than this. Sutidze is now 0-8-1 in his last nine fights but usually goes the distance. Managua, Nicaragua: Bantam: Alex Espinoza (16-1-2) W PTS 10 Yader Cardoza (23-13-1). Super Light: Julio Laguna (14-0) W TKO 6 David Bency (12-9-1,1ND). After a poor start Espinoza eventually takes over the fight and wins the verdict. Cardoza made a strong start scoring with right hooks and had Espinoza on rubber legs with a combination in the third. Espinoza survived by clinching and the chance had gone for Cardoza. Espinoza made good use of his longer reach and landed heavily with shots to head and body. Illegal punches cost Espinoza a point in the seventh but that was evened out when Cardoza was docked a point for a low punch in the ninth and Espinoza’s stronger finishes saw him take the decision. Scores 97-91 twice and a more representative 95-93 all for Espinoza. The 25-year-old “Supernova” suffered his only loss when being beaten by Russian Mikhail Aloyan in February. Espinoza was an elite level amateur winning the national title and collecting a bronze and silver at the Central American championships. The experienced Cardoza lost to Adrian Hernandez for the WBC light flyweight title in 2013 but more recently he gave the then unbeaten 18-0 Jamie Conlan a scare flooring and cut the Belfast fighter when losing a split decision in March last year. Laguna wins the vacant WBC Fecarbox title and gets his second victory in consecutive fights over Bency. When these two fought in November it was for the vacant WBA Fedecentro title and Laguna’s win was controversial. This time he bossed the fight from the outset flooring Bency in the second and winning every round until a cut on Bency’s left eyebrow caused by a punch was ruled too serious for the fight to continue. Laguna is another fighter with good amateur credentials dominating the national scene and winning a gold medal at both the Central American Games and the Central American Championships. Bency was 2-2 in his last 4 fights with the losses being against Brad Solomon and Laguna. Cidra, Puerto Rico: Super Light: Abner Cotto (23-3) W TKO 4 Samuel Santana (11-12-3).Cotto returns to action with stoppage win. Although he did not look to be in top condition Cotto was still too good for fellow-Puerto Rican Santana. Cotto took a while to shed some rust with Santana being competitive over the opening three rounds. In the fourth with Santana on the ropes Cotton unleashed a series of head punches before sending Santana down with a clubbing shot to the head. Santana beat the count but Cotto had him under fire again and reeling on unsteady legs when the referee stopped the fight. Cotto, 30, wins the vacant WBC Fecarbox title with his twelfth victory by KO/TKO. He has lost important fights to Omar Figueroa, Francisco Vargas and Javier Fortuna but this victory in his first fight for exactly nine months is his fifth in a row. Santana was coming off four wins over sub-standard opposition. and this is his fourth career loss by KO/TKO. Gloucester, England: Super Light: Akeem Ennis Brown (11-0) W TEC DEC 5 Chris Jenkins (19-3-1). Brown wins the vacant WBC Youth title with technical decision over Chris Jenkins. This was a much anticipated fight with the tall unbeaten Brown against the much more experienced Jenkins. Brown went into the lead early but the rounds were close. In the third a clash of heads saw Jenkins cut over his left eye. The cut worsened and the fight was stopped in the fifth and went to the judges who did not score the uncompleted round. Scores 40-36, 39-37 and 39-38 for Brown. The 22-year-old local Brown already has a points win over the current Commonwealth champion Glenn Foot and looks a good prospect. He was 25-6 as an amateur without winning any major tournaments but is progressing well as a pro. Jenkins drew and lost to Tyrone Nurse in two fights for the vacant British title in 2015 and lost on points to unbeaten Philip Sutcliffe Jr in 2016 but had scored three wins in 2017. Villa Angela, Argentina: Super Bantam: Diego Ruiz (18-2) W PTS 10 Victor Garcia (16-8-1). “The Prophet “Ruiz wins the vacant WBC Latino title with wide points decision over the much smaller Garcia. Ruiz was in control for most of the fight and floored Garcia in the sixth. It did not look as though Garcia was going to get up but he made the effort. He was in deep trouble but Ruiz missed his chance to end it early. Ruiz already had the fight won when he was penalised in the ninth for a low punch and he ran out a clear winner. Scores 97-91 twice and 99-89 for Ruiz. The Argentinian champion has now won his last seven fights. Mexican Garcia was 7-1-1 going into this one but was moving up to ten rounds for the first time. “Big Joe” Djeko wins the vacant IBO Continental title with win over Argentinian Gudino. It was a unanimous decision but Gudino made Djeko fight hard for the win. Scores 96-93 twice and 98-91. Djeko is 10-1-1 in his last 12 fights. He has an early carer draw with EBU rated Bilal Laggoune and his only loss in those 12 fights was a very close decision against then unbeaten Craig Kennedy when he had Kennedy on the floor twice. First fight outside Argentina and first loss for Argentinian No 3 Gudino. Danish based Kore wins battle of unbeaten fighters. After taking the first round Kore had to fight hard in the second as Ypremyan battled back and it turned into an entertaining fight. Kore hurt Ypremyan in the fifth and went on to finish the fight and collect the vacant IBO Mediterranean title. The Ivory Coast fighter remains unbeaten. He lost on a disqualification in an incident filled fight 2016 but the Danish Federation changed that to a No Decision. French-based Ypremyan had won his last seven fights.